Some people might say it’s all in your head. And it might be. But as it relates to medicine, there are ways to find out. Two procedures performed on the skull or brain are called a craniotomy and craniectomy. What are they and how are they different, you ask? In a nutshell, both a craniotomy and craniectomy involve removing a section of the skull, or cranium, according to Neurosurgeons of New Jersey. Their main difference is that the skull bone is replaced at the end of a craniotomy, but not during a craniectomy. A craniotomy is when the surgeon removes part of the bone from the skull and then replaces the piece of bone, called a bone flap, at the end of the procedure. A craniectomy is when the surgeon removes part of the bone from the skull without replacing the piece of bone, called a bone flap, during the procedure. Both procedures are performed by a neurosurgeon in a hospital setting while the patient is unconscious and under general anesthesia. There are many reasons why a surgeon may elect to perform a craniotomy or craniectomy. The decision as to which procedure to perform is based on the condition treated. However, usually, when one of these procedures is performed, it is combined with another surgical procedure to treat the brain’s condition. A craniotomy is usually performed to gain access to the location where further treatment is needed. An example would be when a neurosurgeon needs access to take out a brain tumor, repair a defect, or perform surgery on a blood vessel in the brain. There may be additional reasons for a physician to recommend a craniotomy. 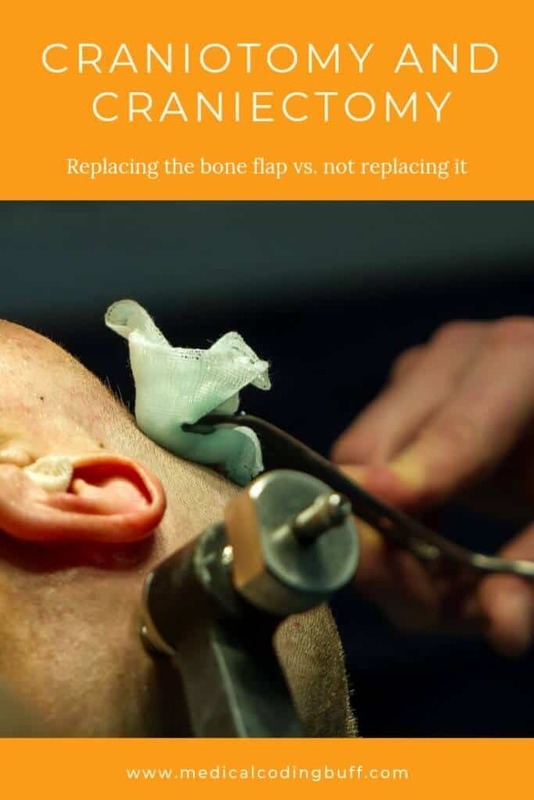 Remember, with a craniotomy, the bone is removed and then it is replaced at the time of the procedure. A craniectomy is often performed in an emergency situation to relieve pressure. An example of this might be a patient has had a stroke or traumatic brain injury, and a surgeon needs to immediately remove part of the skull to prevent damage from increased intracranial pressure caused by the buildup of fluid and/or swelling. When this situation occurs, the patient requires two operations: one to remove the part of the skull, and another to replace it several weeks later once the swelling has gone down. Another reason for a craniectomy may be to remove a tumor in the skull. In this situation, a cranioplasty would be done at the time of surgery to repair or reshape any irregularities in the skull. This is different than when trauma occurs. In that case, the cranioplasty would be performed several weeks later once the brain swelling has reduced. A craniotomy can take three to five hours or longer based on the underlying problem, according to Mayfield Brain & Spine. Patient is prepared. General anesthesia is provided, the patient becomes unconscious, and the head is placed in a fixation device to prevent head movement. A drug called mannitol may be given to relax the brain. If image-guided technology is used, the system will be set up. Incision is made in the skin. Scalp is shaved and prepped with an antiseptic in the area of the incision, usually behind the hairline. The incision is then made. Craniotomy is performed. First, the skin and muscles are pulled away from the bone and folded back. Then a drill is used to make small burr holes in the skull. A small saw called a craniotome is used to cut the outline of a bone window by way of the burr holes. This bone flap is subsequently lifted and removed to expose the dura, the protective brain covering, and it is set aside. At the end of the surgery, the bone flap will be replaced. Brain is exposed. The dura is opened and the brain is exposed. A pathway may be made between the brain and the skull with retractors. Magnification glasses, referred to as loupes, or an operating microscope are used to view the nerves and vessels. Problem is repaired. Small instruments are used by neurosurgeons to work deep inside of the brain. Instruments include long handled scissors, dissectors and drills, lasers, ultrasonic aspirators (to fragment the tumors and suction up the pieces). In order to stimulate certain cranial nerves while monitoring the response in the brain, evoked potential monitoring may be used. The reason for this is to maintain nerve function during the procedure. Craniotomy is closed. The problem has been removed or repaired. If any retractors were used, they are removed, and the dura is sutured shut. The bone flap is returned to its original location, and titanian plates and screws secure it in place permanently. Sometimes a drain may be placed under the skin to remove blood or fluid for a couple of days. Then the muscles and skin are closed with sutures, and an adhesive dressing is placed over the incision. The patient and his or her physician should discuss the benefits and risks of having a craniotomy and craniectomy (stated below) and determine if the benefits outweigh the risks. The physician can explain the potential outcomes so the patient understands any risks associated with the procedure or any other procedures involved. Instant relief of pressure after a section of bone is removed, which is particularly significant in a case of emergency where immediate treatment could prevent further damage and save a patient’s life. Generally, a patient can expect to remain in the hospital for about a week after having a craniotomy or craniectomy. After that, the patient must restrict activity for four to twelve weeks. Since these procedures may be part of the treatment for many brain conditions, the recovery time can vary. Here is a short video that gives you some important facts about these two procedures. Having a good knowledge of brain anatomy is important in medical coding, especially for coders who code for neurosurgery. 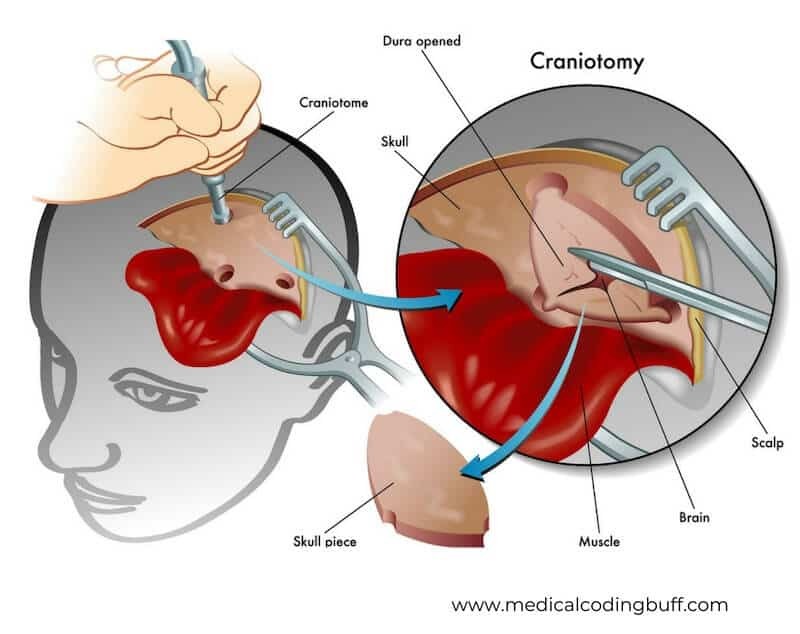 A coder should understand what a craniotomy and craniectomy are and how they differ, reasons they are performed, benefits and risks, and recovery time, This foundation, along with the coding guidelines, will make it easier to look at the physician’s documentation and select the correct CPT code(s).